German modernist architect Konrad Wachsmann (1901–80) had a career-spanning interest in construction processes—in particular the prefabrication of building components and their assembly within modular systems. In this respect, Wachsmann was a pioneer whose ideas and work paved the way for today’s industrialized construction. Marianne Burkhalter and Christian Sumi synthesize years of careful research into a compelling look at this highly creative architect. 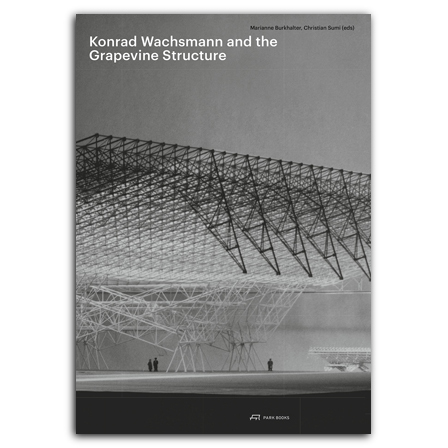 At the core of the book is Wachsmann’s dynamic Grapevine Structure, a universal construction element developed with students during his tenure at the Chicago Institute of Design—part of what is today the Illinois Institute of Technology. The book also investigates Wachsmann’s Packaged House System, his relocatable hangars for the US Air Force, and, in particular, the Local Orientation Manipulator (LOM), developed with John Bollinger and Xavier Mendoza at the University of California, Los Angeles. Fabio Gramazio, Matthias Kohler, and Hannes Mayer (Gramazio Kohler Research, ETH Zurich) revisit the LOM from a contemporary perspective where robotic fabrication processes have become increasingly common. The book also features an essay by Andreas Burkhalter on Wachsmann’s legendary knotted joints in the context of possible similar structures in the human brain, and a conversation by Marko Pogacnik with architects Hermann Czech and Friedrich Kurrent on Wachsmann’s lectures at the Salzburg Summer Academy. Published to coincide with an exhibition on Konrad Wachsmann at the 2018 International Architecture Exhibition of the Venice Biennale, the book features rich illustrative material. Winner of the DAM Architectural Book Award 2018.
graduated in zoology and in neuroscience from University of Zurich. He has worked as Postdoctoral Fellow at California Institute of Technology in Pasadena CA and at the Department of Neurobiology, Harvard Medical School, in Boston MA before his current appointment as Professor of Neuroscience at Washington University School of Medicine in St. Louis MO. In 2013, he served as Wiersma Visiting Professor at California Institute of Technology and in 2018 he received the Distinguished Investigator Award from Washington University. is an architect and co-founder of Zurich-based Burkhalter Sumi Architects. She taught as a professor at the Academy of Architecture in Mendrisio, Switzerland, 2008–2016 and held appointments as visiting professor EPFL in Lausanne and SCI-Arc in Los Angeles. is a Senior Researcher of Gramazio Kohler Research at ETH Zurich, where he also directs the Master of Advanced Studies program in Architecture and Digital Fabrication. Prior to this he has held teaching appointments at the Academy of Fine Arts in Vienna and the Bartlett School of Architecture, University College London as well as University of Westminster, London. He also is co-publisher of the magazine Manege für Architektur in Zurich. is Associate Professor of History of Architecture at University IUAV in Venice. He has held appointments as visiting professor and lecturer at various universities in Germany, Austria, and Switzerland. is an architect and co-founder of Zurich-based Burkhalter Sumi Architects. He taught as a professor at the Academy of Architecture in Mendrisio, Switzerland, 2008–2016 and held appointments as visiting professor at EPFL in Lausanne, Harvard GSD, University of Geneva, and University of Strathclyde in Glasgow.